Excellent guide. Very knowledgeable and accommodating. Magnificent view! Would recommend more child friendly activities though. Examples could be feeding animals, or learning how to make hand-made things from sheep fur? Our driver was friendly and very knowledgeable about the Christchurch area. We didn't realize we got on the train several kilometers outside of town and were shoveled in like stowaways. The train ride was peaceful however and the scenery breathtaking even in the rain. Fortunately by the time we got to the jet boat rides the sun had come out and the experience was wild--for young and old alike. Everyone left with huge smiles. The sheep farm demonstration was hosted by the most lovely couple who made us feel so welcome and at home. A close up demo of a sheepdog at work is always worth seeing, and I think the owner sheared his sheep in about three minutes flat...so cool. Another great day--thank you Viator for pointing us in the right direction. Great trip with a great tour guide. Sue kept us informed about the local history and geography in a running commentary. The trip to the sheep farm with a shearing demonstration was a once in a lifetime experience. Those that went on the jet boat ride had a great time. All and all it was a great outing, will remember that the rest of our lives. The trip was customised to suit most travellers. We were picked up at the hotel in a small mini bus with only 12 other passengers. The train left from Christchurch but we travelled to Springfield on the bus to pick up the train as there was little of interest to see between Christchurch and there. The driver stopped at a small cafe at Springfield to enjoy a coffee - the pies were amazing. 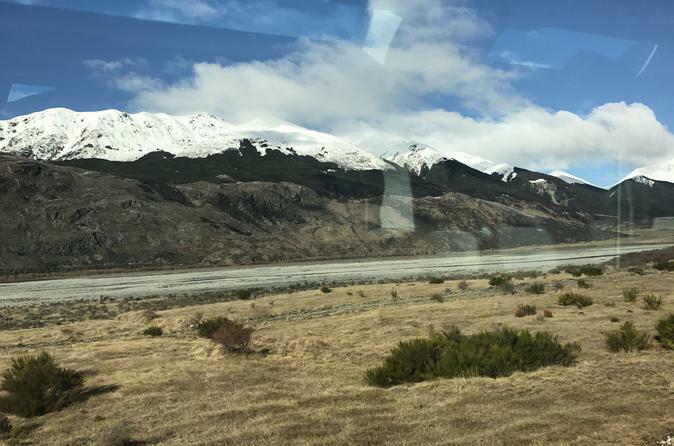 The train arrived after refreshments and the trip to Arthur's pass was incredibly scenic with great views on both sides of the train. The viewing decks were always crowded so getting good photos was not easy, however we took many through the panoramic windows and they came out fine. The minibus was waiting when the train stopped and we disembarked. The driver then took us to some great sights that bigger coaches could not access and we had lunch in a mountain hotel overlooking a river. Quite a long day but full of great views. Arthurs Pass railway station has no name signs on the lamp poles, or on train announcements, so we were surprised to arrive sooner than expected and in the observation car four or five carriages ahead of our assigned seats and belongings. It took a while to get back to our seats and bags, with the throng of people queueing to exit the train. We were late, and our driver was concerned that we had become left on the train going to Greymouth. The trip was well planned and varied. We rode in the train, walked a short hike, saw flora and fauna, got up close to the sheep shearing and enjoyed a tasty lunch. The guide was knowledgeable and shared only the important sites along the way. This gave us time to absorb the breathtaking scenery and immerse ourselves in our own thoughts. It was a great day! Great trip, well organised. Thank you. It was really awesome. I started The journey early morning with my family. The sightseeing was incredibly....In my whole life I haven't seen it before ....I really recommend the tourists to try that journey. 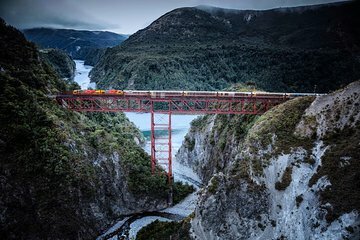 I read an article about the best 16 trains journeys around the world and The Arthur's Pass Day tour was one of them. we visited a sheep farm and we had demo about sheep shearing from the owner of the farm. it was really amazing journey for my family. I would like the thank every one starting from the viator company and especially our coach. Unfortunately I don't remember his name.